Announcement Thanks for stopping by. Current turnaround time is 1-2 weeks plus ship time. Thank you! Thanks for stopping by. Current turnaround time is 1-2 weeks plus ship time. Thank you! 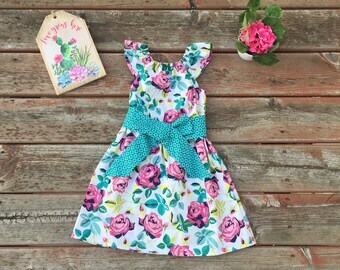 We order an Easter dress every year and this year was no disappointment! And as always I found a fabric I liked and they were able to find the fabric and had the dress to me in less than a week! As my daughter grew, she wore my creations often and had people asking me about her outfits wherever we went. Some dear friends and family members encouraged me to try selling similar items on Etsy. So I purchased a few different fabrics and more patterns and viola - the rest is history! I will be honest here and admit it wasn't an overnight success - but eventually one order came in, then another and another and so on. After 5 years, my shop is still going strong. I am undoubtedly blessed to be one of the lucky ones here on Etsy. I have the most fun picking out fabrics because the choices are endless and I could literally spend days browsing through fabrics to find just the right one. I love trying new patterns and designing new things for Saige - since as she grows, her style changes. She is just the right amount of sassy too and has no problem giving her opinion on my designs or recommending fabrics that she likes. I wanted a simple but sweet shop name with a little bit of flair, and one that was a tribute to my daughter. After tossing some names around that didn't quite sound right, we finally settled on Sassafras Saige. The "Sass" in Sassafras fits her well most days! My hope is to one day teach my daughter how to sew and follow in my footsteps. We are on our way with her first sewing machine. She already has a few projects under her belt and a couple design books of dresses she'd like to make someday. Thank you for visiting my little shop in the fabulous world of Etsy. And special thanks to all my wonderful customers, neighbors, friends and supporters. I would not be able to do this without you. Welcome to Sassafras Saige. The name for this shop was inspired by my "sassy" little girl, Saige. 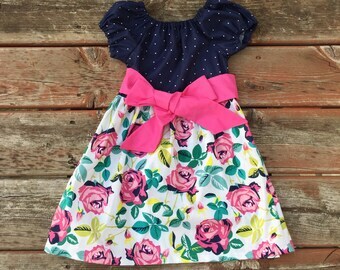 I enjoy making clothes for her and have fallen in love with making items for your children as well. Thank you all for making this possible. As always, I am open to suggestions on what I can offer; and value your feedback on any improvements I can make to my shop or products. Thanks so much for stopping by. Please tell your friends about Sassafras Saige! Due to the handmade nature of my items, I do not accept returns. I will however accept returns if item is grossly misrepresented or defective in the construction of the garment. This does not include items purchased in the wrong size or color or items that are washed improperly. All items should be laundered in cold water on the gentle cycle and dried on low heat or hung to dry. If you have a High Efficiency washer, hand washing is highly recommended. Please contact me if you are unhappy with your purchase so we can work together to find a satisfactory resolution. There may be additional delays due to weather, holiday, and USPS exceptions beyond our control. Sassafras Saige is not responsible for packages lost by the postal service. Paypal and credit cards are welcome. 6% sales tax applies to purchases made by Michigan residents. All shipping is via USPS and will be shipped within 1-2 days of completion. Please provide current and correct USPS mailing address to ensure your purchase reaches you. I will send a tracking number when your item(s) are completed and mailed out. Thank you! If you reside in the West Michigan area, please contact me for pickup or delivery options to save on shipping charges. SHIP TIMES: Turnaround time for made to order items shown in my shop is typically 1-2 weeks. Often times I can ship in under a week. Special orders using fabrics not normally used in my shop take 3-5 weeks depending on how quickly fabric is shipped to me. Ready to ship items usually ship next day. If you need a rush on an order, please let me know. BUSINESS HOURS: I have recently obtained a full time job so my Etsy hours vary. Please understand that in my free time, when I am able, I am working hard to get orders sewn and shipped in a timely manner and may not answer questions/convos right away. I will do my best to answer inquiries within 1 business day. Weekends are reserved for family time. UNIQUENESS OF DESIGN: All items are handmade by me, in my smoke free home and no 2 items are exactly the same. Pattern placement will always vary from item to item, especially in prints, so the item received may not look exactly as it appears in the picture. Please keep this in mind when you order. Thank you. Length is from neckline to bottom hem, width is across the chest from one seam to the other. This dress is loose fitting and length falls at just above the knees. 0-3 m: Length 12.5", Width 12.5"
3-6 m: Length: 13.5", Width: 13"
6-12 m: Length: 15.5", Width: 13.5"
12-18 m: Length: 16.5", Width 14"
18-24 m: Length: 18", Width 15"
2T: Length: 19.5", Width: 16"
3T: Length: 21", Width: 17"
4T: Length: 22", Width: 18"
5/6: Length: 24", Width: 19"
7/8: Length: 26", Width: 20.5"
9/10: Length: 28", Width: 22"
11/12: Length: 30" Width: 23"
0-3 m: Length: 12.5", chest 20"
3-6 m: Length: 13.5", chest 21"
6-12 m: Length: 14.5", chest 22"
12-18 m: Length: 16.5", chest: 23"
18-24 m: Length: 18", chest: 24"
2T: Length: 19.5", chest: 25"
3T: Length: 21", chest: 26"
4T: Length: 22", chest: 27"
5/6: Length: 24", chest: 29"
7/8: Length: 26", chest: 31"
9/10: Length: 28", chest: 33"
11/12: Length: 30" chest: 35"
Need a different measurement? Let me know what you need at checkout and I will do my best to accommodate your request. ***Custom orders*** I am not accepting custom orders at this time. *** Wholesale requests*** I am not accepting wholesale orders at this time. ***Professional photographers*** I am currently not accepting trade for services on my items. Due to the size of my shop, I often only offer a handful of items from the same design. By the time the items are sent off to be photographed, they may no longer be in stock. In the future when I have more time and resources to dedicate to my shop, this may be an option. Thank you for your interest! Are you a fan of Sassafras Saige on Facebook yet? You can find us by typing in Sassafras Saige in the Facebook search box or copy and paste the following into your browser: www.facebook.com/sassafrassaige. Facebook fans get sneak peeks on new items and often get them at discounted prices before they are listed on Etsy. Fans also have access to sales and giveaways. Check it out and tell your friends!